Do try them out! Kids will enjoy every bite! Roast the rava with 1 tbsp oil for less than 5 minutes and make sure there are no lumps. Do not burn. Heat 1 big ladle oil in a Kadai. Add mustard seeds. Once they stop spluttering add chana dal, urad dal. After a few seconds add onion, green chilies, curry leaves and salt. Fry till this onions are translucent. Now add the rava and fry for sometime. Do not burn. Removed from heat and allow to cool. Now add curd. If the curd is too thick, add a little water. Curd and water together should be 3 cups. The batter should be same as Idli batter ( neither thick nor thin) consistency. First add 21/2 cups, then slowly add the 1/2 cup. If you still feel the batter is thick, add a little water and adjust. Add soda. Add coriander leaves after a minute or 2. If added immediately, the coriander leaves turn black. Pour in Idli container and steam for 10 – 15 minutes. Garnish with thinly sliced cherry tomatoes and grated carrots if you like. 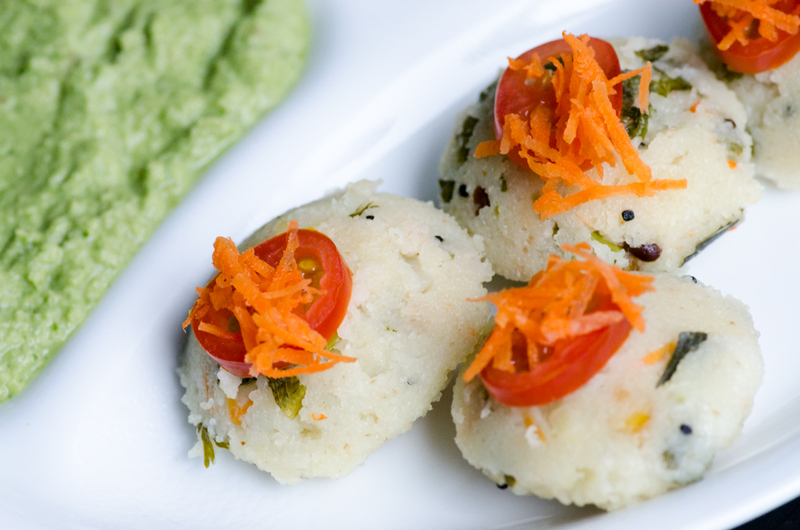 Looks attractive and kids would love to eat these mini rava idlis. 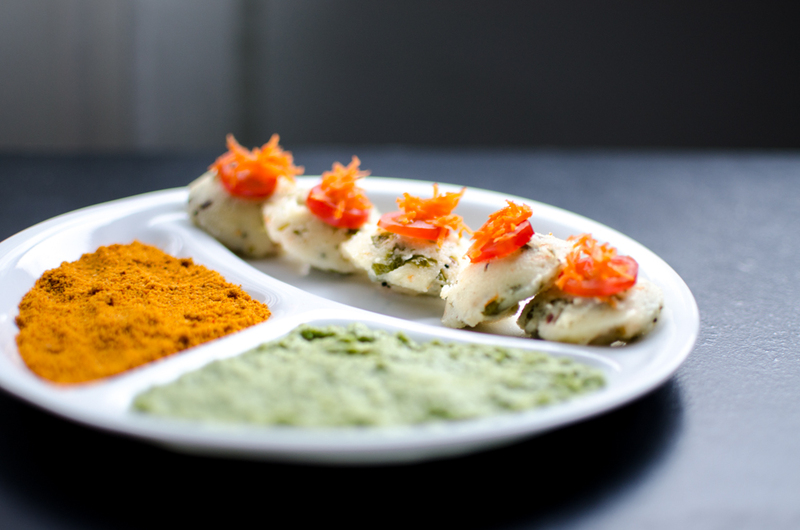 Serve with any chutney, chutney podi or vegetable Saagu. This entry was posted in children, kids favorite, Vegetarian and tagged breakfast, idli, kids, Rava Idli, south indian breakfast. Bookmark the permalink. Ooooooooooooooo….. And look at the color of your Molaga Podi.